This vintage peanut butter marshmallow squares recipe was often used by my Aunt Sylvia McIlmoyle to make yummy treats for family occasions. She wrote out the recipe and gave it to Mom who found it one of the best squares recipes she had ever tried. These dessert squares are quick and easy to make and never fail to turn out well. The golden-colored treats look as though you spent hours making them, but only you will know the truth. This recipe's a keeper, folks. You'll use over and over again! Caution: Aunt Sylvia's peanut butter and butterscotch flavored marshmallow squares are sinfully delicious, and you won't be able to stop eating them! Mix butter, peanut butter, and butterscotch chips in a double boiler just till melted, then remove from heat. Place 3 cups miniature marshmallows in a buttered pan and spread on warm mixture. Save a few chips and marshmallows to decorate the top, or be generous and add extra. Cut in squares when cool. It's that easy. It's that delicious! If you cannot obtain miniature marshmallows, you could try using sliced large marshmallows instead. Use 10 large marshmallows to replace each cup of the miniature kind. Substitute chocolate chips to make Peanut Butter Chocolate Squares. Yummy! This peanut butter marshmallow squares recipe is one that a friend of Mom's sometimes used, so I included it for you to try as a comparison to Aunt Sylvia's recipe. Melt above together slowly. Don't let it get too hot. For me, sharing this brings back fond memories. The above photo was taken in October 1979, on my parent's 40th wedding anniversary. 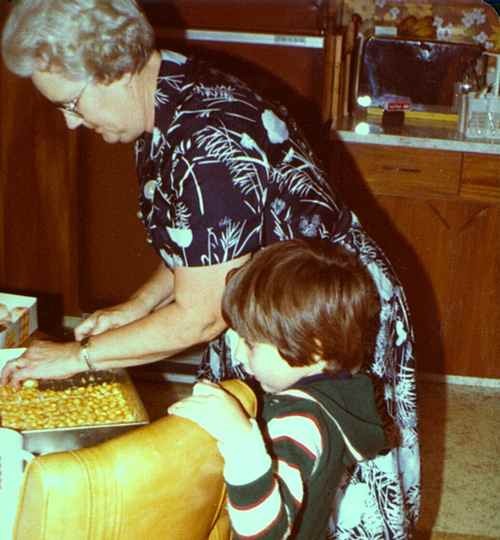 It shows my Aunt Sylvia cutting a panful of her delicious marshmallow squares while being carefully watched by our eldest son Peter who was hoping to get the biggest piece. Enjoy trying this favorite family treat. 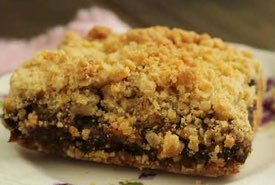 If you need some amazing dessert squares to take to a party or picnic, you'll want this recipe! An amazing dessert helps to make family occasions so special for the children, and a fond memory throughout one's life. Make some delicious memories today!